Beautiful round up and Harini , you have totally rocked . Loved the breads , they were amazing . I haven't bookmarked any posts , I am bookmarking the recaps , all the treasure is hidden in it ! 👌👌 one fantastic marathon . Kudos . Stunning round up Harini and you came up with so many astonishing bakes, eventhough you had hard time with your pictures lost, you still rocked and definitely a beautiful mega marathon for u. Awesome round up Harini. I loved all your breads and have bookmarked a ton of them. 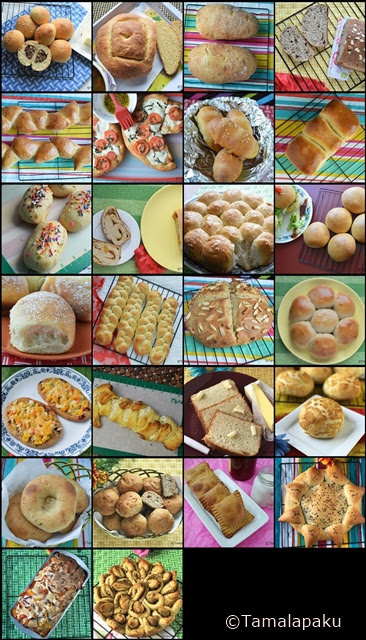 I wish I could get to these ASAP because some of your breads were just too pretty and too tempting. Such a wonderful recap Harini. Love all of your baked breads and buns. You should write a book. You really bake like a pro. Such an amazing bread collection Harini. Loved them all. I was most excited to see your post everyday since we had a similar sub theme. You totally rocked!! Lovely collection of Breads.. So many are in my to do list noW!! Cant wait to try it out !! Harini, each and every bread of yours have come out amazing. What a lovely collection and I have bookmarked many rolls from yours.